It’s the day after Canadian Thanksgiving, and I’m slowly coming out of my turkey-stuffing-cranberry-sauce-gravy-induced coma. I spent the three days before Thanksgiving Monday prepping and cooking for the big meal, so as not to end up with a disaster like I did when attempting my first turkey day back in 2012. The hard work paid off, and I had the pleasure of seeing my guests lounging about the living room in a happy stupor after the meal. So what is my secret? Organization. Planning, planning, planning. First, make your menu. I did mine on Thursday. Choose recipes that you know (or at least that you’ve seen made), and that have relatively simple ingredients and processes. Don’t make life harder for yourself. Second, plan to make everything in advance. I started cooking on Friday, and that helped keep things from getting overwhelming. 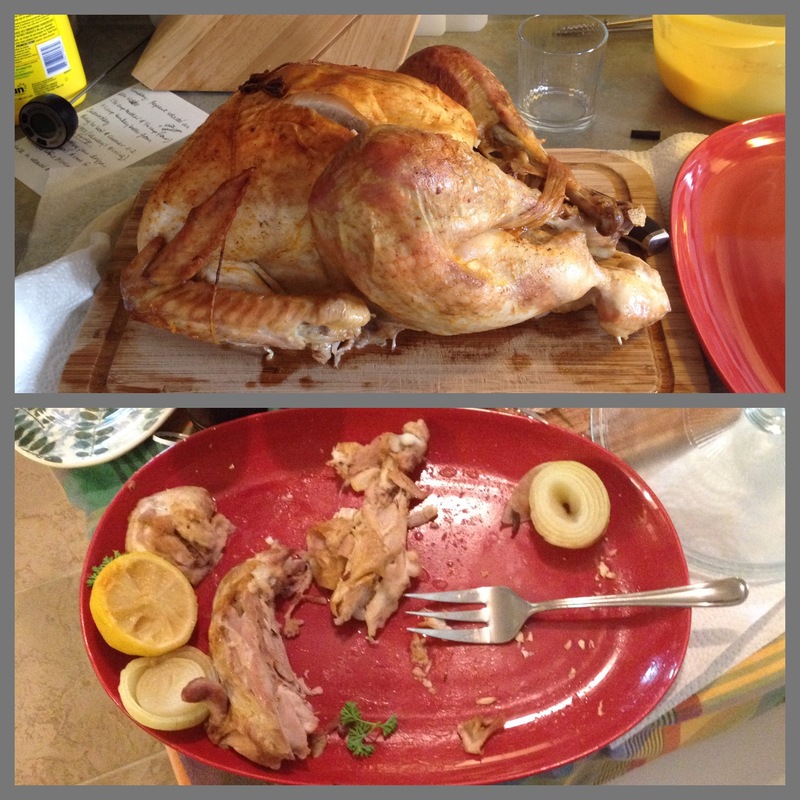 By the time Monday came around, the only cooking I actually had to do was the turkey! So here is a breakdown of my Thanksgiving-prep period, complete with recipes. For those of you who celebrate American Thanksgiving, feel free to use this as a guide! With your menu (and hence, your shopping list) done on Thursday, you can hit the stores on Friday. 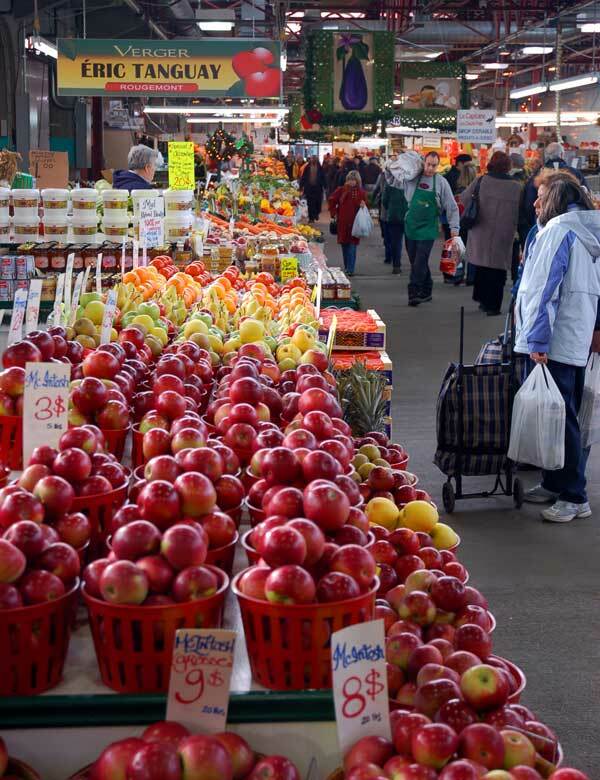 I visited Montréal’s Marché Jean Talon for all my fresh ingredients. 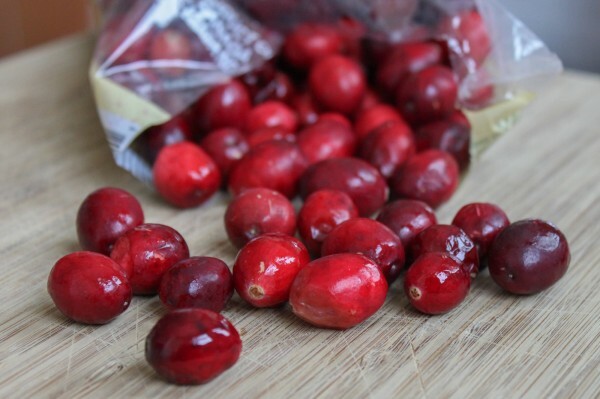 Apples, pears, cranberries, sweet potatoes, etc. Next, I visited les Volailles et Gibiers Fernando on rue Roy and picked up a 4.8kg (10.8lbs) turkey. I went for fresh because we’ve never done frozen turkeys in my family, but that’s up to you. After my experience in 2012, I had learned the importance of picking up your turkey ahead of time! Coarsely slice your apples (no need to core or peel) and toss them into your largest pot. Add the sugar, cinnamon, nutmeg and salt and turn on the heat. Cook the apples down, stirring occasionally, until they’re nice and mushy. It took about 30 minutes for me. Place your food mill over a bowl and spoon your apple goop into the food mill. Leave it to sit and drain into the bowl. This might take a couple of batches if your food mill doesn’t fit all your apples (alternatively you can use a fine strainer). Reserve the runoff liquid. Pass your apple goop through the food mill, making sure to get every last bit of delicious moisture. If you find your applesauce is too dry, add some of the reserved liquid to help moisten it up. Combine the water, sugar and salt in a saucepan and heat until the sugar is melted in the water. Add the cranberries, bring to the boil and simmer for 10 minutes, stirring occasionally, so that the cranberries start EXPLODING (that’s the fun part). More prep tip: See my stuffing recipe later for more info, but it’s a good idea to buy a couple of loaves of bread and dice them up at this point to let them get good and stale. 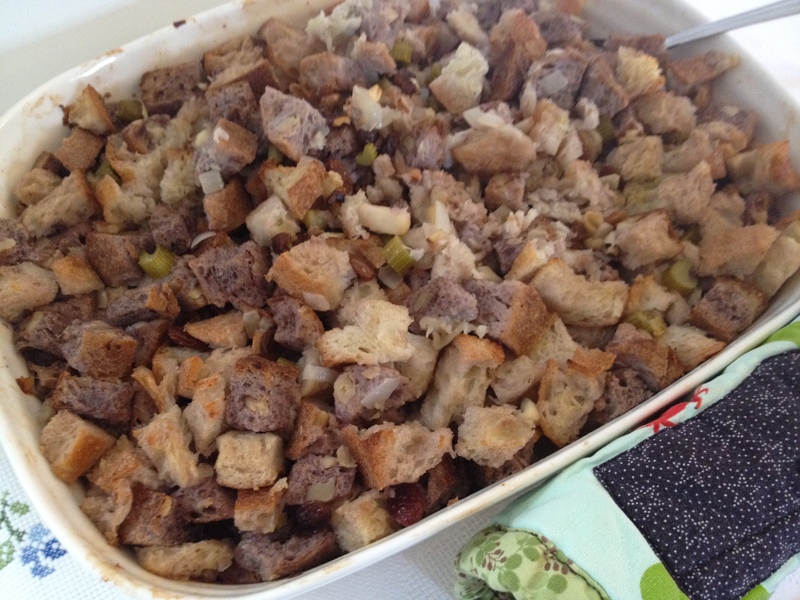 You want stale bread for stuffing because fresh bread gets too soggy. 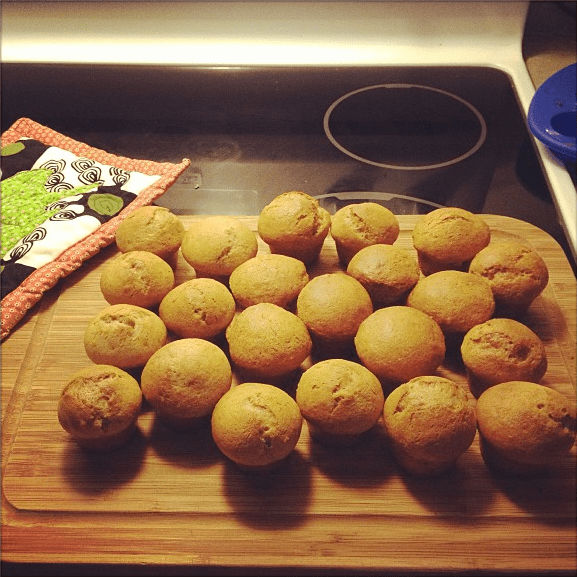 You can find my delicious spiced pumpkin muffin recipe right here. Once cooled, I put them in the freezer to keep them fresh. IMPORTANT NOTE: If you’re cooking both sweet and savory things in one day, always do the sweet stuff first and store it away from the smells of the savory cooking. You don’t want your muffins flavored with turkey broth! This recipe is inspired from the “light stock from poultry” recipe from the Joy of Cooking, but with a couple of tweaks. Bring the raw turkey neck & giblets to a boil and blanch for just 5 minutes. Pour off the water. Add the chicken carcass and enough water to cover everything and slowly bring to the boil. Simmer it, uncovered for 30 minutes. Add the rest of the ingredients. Note: I don’t bother even removing the skin from the onion or peeling/chopping the celery and carrot. I just make sure it’s all clean. Bring that all to the boil and let it simmer, partly covered, for 3 hours. Your house will smell divine. Saturday is also a good day to get some prep done for your recipes for the next day. I did a lot of pre-chopping for Sunday in order to make life easier for myself on Sunday. Sunday was the day to get the bulk of the cooking done. First, I started with dessert. You can find the recipe I used for traditional apple crisp right here. I also made some whipped cream to go with it. Plan to spend a lot of time making this crisp: you need to peel and chop all those apples. It’s a royal pain. PRO TIP: Remove the zest, and juice the orange and lemon first. Drizzle the juice over the apples as you peel and chop them, to keep them from turning brown. I only used half of the zest. If you’re preparing this recipe a day in advance, start by melting a lot of butter in a generous pan. Cook the celery and onion until just softened. Add the apples and cook for a couple of minutes more. 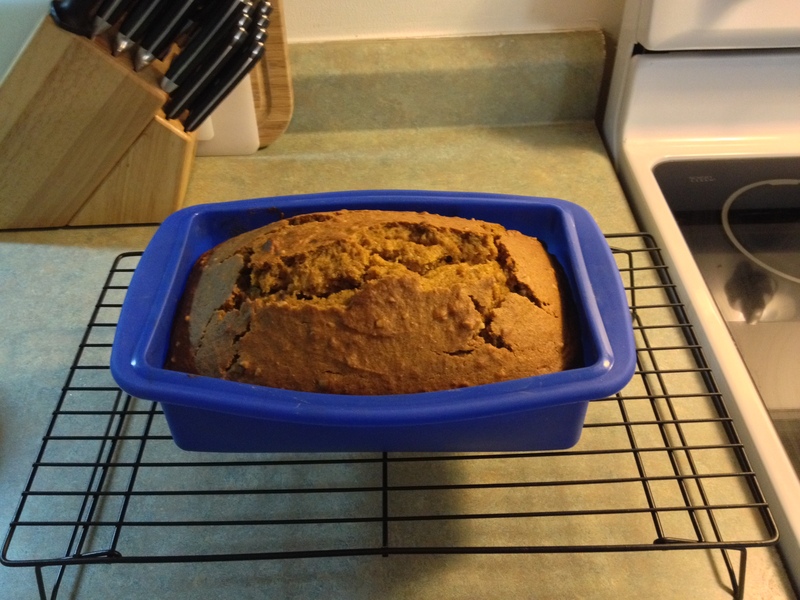 At this point you can set that aside to cool and keep it in the fridge until the day of. On the day: Bring the celery, onion and apple mixture back to room temperature. If you chopped your bread and let it get stale ahead of time, now’s the time to mix it all together into a large bowl with the raisins, walnuts and pepper. Moisten with a mix of the turkey broth you made and chicken bouillon. The benefit of using chicken bouillon from a cube is that it has some sodium. If you don’t want to use bouillon, you’ll have to add salt to the recipe. Add just enough broth to make the stuffing good and moist, but not soggy (perhaps 2+ cups–depends on how much bread you used). Heat it all in the oven at 175°C (350°F). The best time to do that is when the turkey has come out of the oven and is resting before carving. Optional: You can stuff the turkey with some of the stuffing, but that will mean it will take longer for your turkey to cook, and remember that the stuffing has to get to 160°F, which puts your turkey at risk of drying out. I’m going to save this recipe for a later date because this article is getting huge, but this was a nice twist on a traditional Thanksgiving recipe. The spices gave it a different flavor and jazzed up the whole meal. I’ll share this recipe soon, promise. I was probably most nervous about the gravy. I had really failed at it the last time I tried, so this time I was determined to succeed. This YouTube video from Whole Foods was particularly helpful. My mom suggested some modifications, though. On Saturday, I made the velouté. Melt the butter and bouillon cube together in a saucepan and add the flour. Mix it well until it becomes a thick paste and cook for 1-2 minutes. Slowly whisk in your turkey broth, adding a bit at a time until it makes a nice liquid velouté. Simmer for 1-2 minutes. At this point you can remove from the heat, let it cool and put it in the fridge for tomorrow. On the day: Warm up the velouté in a saucepan. When you get the turkey out of the oven, place the roasting pan over two burners and get the drippings up and boiling on medium-high heat. Boil for about 5 minutes. If you don’t have a lot of liquid, here you can use some white wine to get the stuff un-stuck from the pan. Cook for a couple more minutes, then add the velouté. Cook for a couple more minutes, then season to taste. (Note: If you used the bouillon cube, taste first because the seasoning on your turkey and from the bouillon might be enough.) Pour it all into a gravy boat! Voilà! No lumpy gravy! 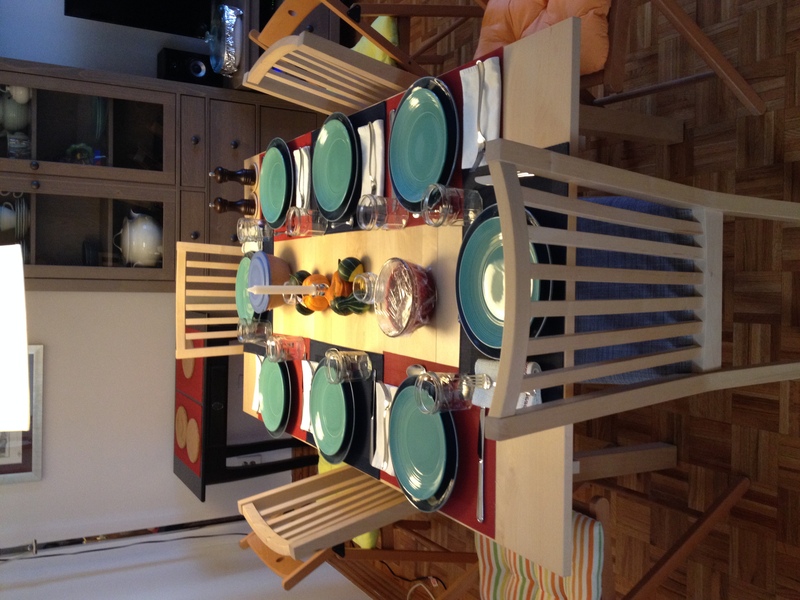 On Sunday, I also tidied the house and set the table for the next day. What can I say, I’m just *that* organized. Because of all the prep work I’d done ahead of time, Monday was relatively easy. All I had to do was get the turkey into the oven at the right time and assemble the stuff I had prepared in the previous days. Preheat the oven to 175°C (350°F). Clean that turkey! Wash it thoroughly inside and out, and pat dry with paper towels. Chop the onions and lemon in half and shove ’em into the cavities (there’s the main one, and the neck one!). Combine the paprika, olive oil and garlic in a bowl and generously rub aaaaaall over the turkey. Really pour it on there! Finally, season generously all over with salt and pepper. Toss the flour into the oven bag and shake it about to coat. Insert the turkey and close the bag with its tie. Place in your roasting pan, making sure that the bag doesn’t stick out of the pan. Cut six 1/2-inch slits in the top of the bag. Put the whole thing in the oven and cook for the appropriate amount of time. My 10.8lb turkey took 2.5 hours (it’s good to check 1/2 hour before to see how you’re doing, temperature-wise. It needs to get to 165°F in the breast). IMPORTANT: Your turkey must sit and rest for 30 minutes after coming out of the oven and before carving. That’s the perfect time to throw in your stuffing and casseroles to heat, while your guests are tantalized by the delicious smells emanating from the kitchen… Also, you can get your gravy ready now. Because I used the oven bag for the turkey, there was tons of liquid in the bag and I didn’t need to use the white wine to detach the drippings from the pan. Well done! You’ve just done a marathon of cooking and prep, and now you can sit back, relax, and enjoy your guests. Since everything was prepared in advance, I was not stressed at all on turkey day, and was able to have fun with my friends without having to worry about anything in the kitchen. Some additional tips: Have someone bring a green salad and some wine, and make sure you’ve got plenty of coffee and tea to offer to people as a digestif. And of course, a post-Thanksgiving meal walk on a nice day is always a good way to wind things up.